You can see the port-a-pottie lines in the background! We showed up VERY early (I was not going to drive 2 hours just to get to “packet pickup” and drive home the day before – when I could show up 2 hours before the race and get it! ), with one of my friends that was running riding along, and my wonderful wife there to root us on. As we arrived (getting a parking spot less than 1000 feet to the starting line,) I realized that I had forgotten my license, a requirement to pick up the race packet. As we got to the table,I was quite lucky – the packet pickup lady was not a stickler for the rules – so after much begging, pleading and groveling (or I MIGHT have just explained the situation and she was quite reasonable.) So luckily, I didn’t get up at 3AM just to watch other people run – That was a good start. Then I got to use a port-a-pottie that no one had used yet – they smell surprisingly “Fresh” when that is true. Definitely another new experience! We passed the rest of the two hours until race time looking at the interesting outfits (seriously Spiderman ran it. THAT sort of interesting) and pretending we weren’t nervous. A lot of people spent this time standing in line for port-a-potties that made the lines in the first picture look short! Then we lined up on the starting line. 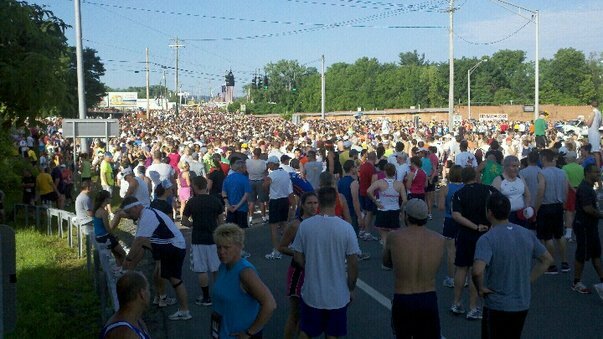 2011 Boilermaker 15k Starting Line – There were more people behind the trees, on the road to the left, as well as more to the right. The Wheelchair races were sent off, and let me tell you – those folks FLY! And the racing wheel-chairs are awesome! But then it was our turn, and the canon went off. Now, to be completely honest with you – this didn’t affect me very much as only the people in the front got to move (the ones in the white race-bibs.) As more time passed (Blue got to move.. then green.. then yellow… then US!) 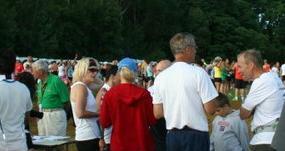 – Well, Doug (my buddy that ran it) and I got to pass the starting line at 10:41 after the start! This is the start - you can tell because everyone is still smiling!!! Let me say – the crowd in this race is incredible! From the beginning to the end, there was not a single point that there were not people out cheering runners on. In addition to “official” water stations, you had people handing out popsicles and spraying mist from their hoses for the runners to cool off. The entertainment is a lot of fun as well – there were bands doing country, rock, alternative, polka (seriously), a steel drum band, bagpiper and a guy ranting about lack of sleep (I really didn’t get this one..) It made the end of the run MUCH easier to get through, despite my legs feeling that 9 miles was a silly thing to run. As far as the run itself, the elevation chart on the boilermaker site made it look like the first four miles were up hill, yet Doug told me it wasn’t. Now that I have run the course, I can see there is a slight incline, but I now agree with Doug – it’s not uphill until around the 4 mile marker. Consequently the first 3 miles were pretty easy. I started out at a nice easy pace with Doug, making (Very) entertaining comments about all sorts of things. He seemed to really appreciate the entertaining banter, encouraging me with such phrases as “Do you ever shut up?” and “you know, I can kick your ***.” Having done my job of boosting his morale, I decided to pick up the pace a bit. (This is a good point to mention – the nice thing about starting in the very back of the pack, is you get to pass people the whole way – and you don’t have to be very fast to do so!) Those first three miles, with the very slight incline, were fine – as I approached the fourth, 2 gentleman started talking with me about the KT Tape I had on my calves, and then about my VFFs. This made that hill VERY easy to go up, and by the time I actually realized we had hit it – it was over half way there! It was challenging to dodge the other participants, as people seemed to hit it and just stop and walk. Consequently, we couldn’t keep the pace we might have otherwise. I cheated on the steep down hill from mile 4 to 5 and ran in the grass on the golf course. This let me not pay too much attention to my form in my Vibrams. I realize this was cheating, but it was one less worry while I was half way through the race wondering if I COULD go 9.3 miles. I kept expecting to “hit a wall” – as I hadn’t been doing the distances I wanted to in my daily runs. I (thankfully) never did. I tried to watch my time as I ran with an initial goal of averaging around 10 minutes a mile. As I neared the 8 mile mark, I was tired – but still strong and if I picked it up, I thought I could hit 90 minutes. That last 1.3 miles (especially the last .3 part – I swear they kept moving the finish line!) was definitly the hardest, as I picked it up A LOT – Mile 9 was my fastest, and was 2 minutes 47 seconds faster than my slowest! 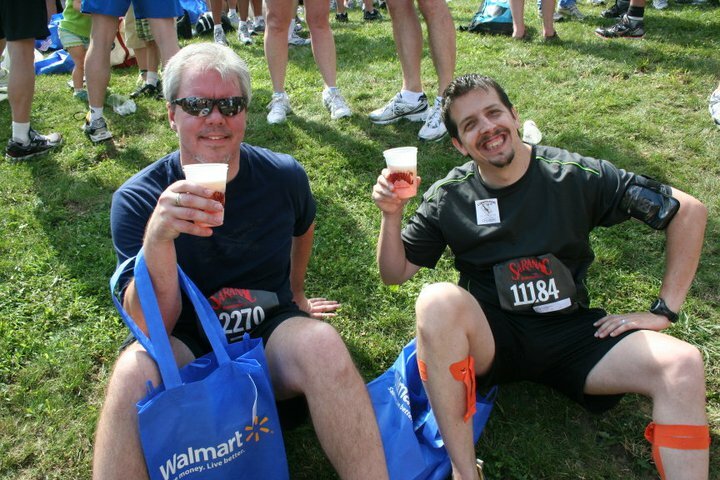 Doug and I enjoying our well-deserved reward! Well done, man, great report and brilliant work on the negative split! I am very jealous of the free beer. Thank you! Its not macaroon’s in Paris – but it may have been the best beer of my life! I should have run the entire thing faster, but I had never done a race this long. I think the negative splits are a reflection of my realizing I wasn’t running fast fast enough, but, I hadn’t run anything near this long since I did 7.8 Miles on April 29th (10 on Apr 16th) – So I am quite pleased with my time. Next year however, I would like to averaage that 8:12 rather than have it be my fastest! This year is focused on distance however – since it has my first marathon in it! Great job! 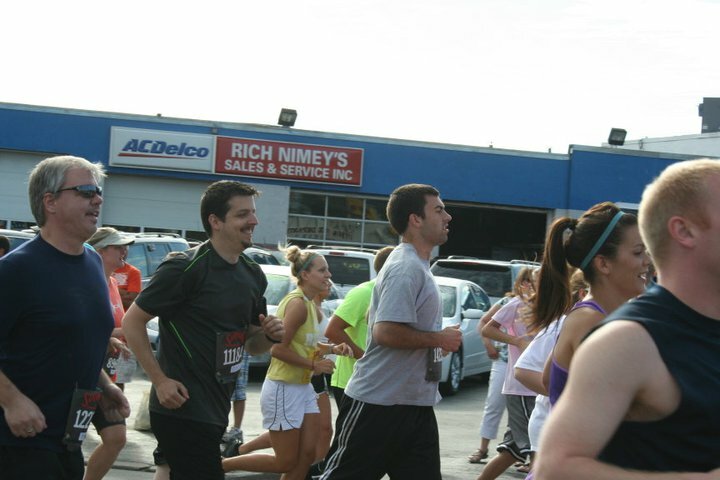 It’s a terrific race to run just because the crowd keeps you going. There seems to be a water stop every mile (although I couldn’t find any Gaterade). Hope you were able to enjoy some of the best Utica foods, such as greens? If not,make sure next year you indulge in some Utica Italian. It’s so good! It was un-believably fun! 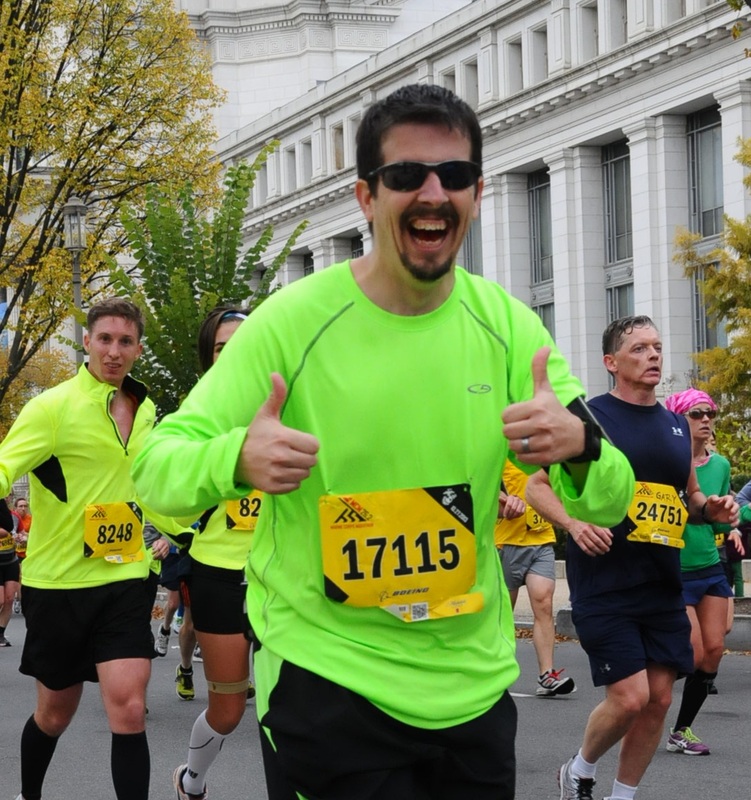 I honestly never stopped smiling (well, until that last mile that seemed never ending.) We did not get a chance to hit any restaurants – but I am only 2 hours south in Binghamton, so we are planning some trips up to Utica this summer – just to see the restaurants and such!